Yesterday’s 37th annual Christmas parade had everything you would expect — colorful floats, music, fire trucks, celebrities and, of course, Santa. Even the green ‘Grinch’ received applause. 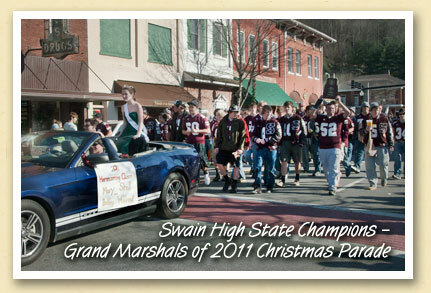 But the biggest cheer went up for the Swain High Maroon Devils football team – 2011 State 1AA football champions and Grand Marshals of the parade. Led by homecoming queen Mary Shell, our local heroes proudly held their trophy high throughout the parade. The entire county shares your pride, guys.